Pain is just part of being any athlete. Regardless of your sport or your workout style, you have doubtlessly dealt with a huge variety of aches and pains at some point in your career, likely on several occasions. But another aspect of athleticism is the ability to push through pain and discomfort, sometimes to the point of being counterproductive. It’s important, than, for everyone from casual exercisers to professional athletes to understand the different signals their body might send them. What can you safely push through? What pains should take you out of the race? When should you see a doctor? Even if you don’t know it by name, you’re familiar with DOMS or Delayed Onset Muscle Soreness. Although the exact cause of DOMS isn’t fully understood, the prevailing view is that the soreness is a result of your body’s efforts to repair microscopic damage that your muscles suffer during exercise. You are especially susceptible to DOMS if you’re doing a workout that’s new to you. DOMS is also more common in weight training, specifically with activities that feature eccentric contractions like the lowering phase of a bicep curl. The symptoms of DOMS, as opposed to other forms of soreness, are tenderness, stiffness and swelling in the affected area. Generally, this doesn’t require a visit to the doctor. You should, however, see your doctor if these symptoms become debilitating or if your urine becomes dark. Whether or not to continue working out while dealing with DOMS is largely up to you. Sometimes DOMS may cause a loss of strength in the affected area which would limit your ability to exercise anyway. However, if it becomes too difficult or painful for you to continue, you should discontinue the activity for a few days. While DOMS, as the name suggests, hits 24 to 72 hours after the actual exercise, acute muscle pains start up during your workout. Runners may be familiar with this sudden pain in their calves, especially when they were first starting out. These pains can have any number of causes and you should immediately stop the activity if you feel a sharp pain in your muscles. If the pain persists, see a doctor. Joint pain may start up during or after the activity and usually involves swelling and stiffness. This can occur in virtually any joint involved with your sport but knees and elbows are the most common problem areas. While in many causes this is just an issue of irritation from repeated use, these joint pains could be a symptom of something more serious. You should be especially cautious if the pain is debilitating since this sort of injury could require medical intervention. How have you dealt with the aches and pains of exercising? Please share your hints in the comments! Raised in Seattle, my friends always headed north to Alaska to work in the fisheries every summer. Even my dad and brothers would fish along its coast for father/son vacations… yet I never visited–until this weekend. Naturally I made a running trip out of it. Every year, nearest the summer solstice, the Mayor’s Marathon and Half Marathon are held with participants from across the world and all 50 states. 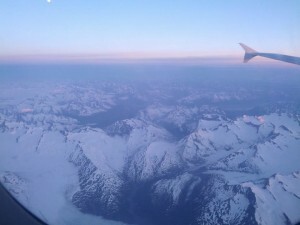 I flew into Anchorage, landing at midnight. The photo above was taken just before 12 a.m. and easily displays the famous “midnight sun.” Children played in the streets after 11 p.m. each night and downtown held a Summer Solstice Festival–making it the perfect weekend for a race. Bring bug spray. Most of the course traverses through back woods and not along typical city streets. I quickly learned that mosquitos in Alaska are no joke. Even “Off” bug spray is no quick defense. Rather, ask the locals what works and head out to the grocery store to purchase a can before race day. Every runner spent part of the race just swatting bugs. One girl had at least 20 bugs on the back of her head. My neck turned red with bites and mosquito guts encased my hands. You hike. Approximately a mile of the course is literally into the woods–not along concrete trails. You run along bulldozed grass and battle the bugs along the way. The scenic course. I felt grateful for carrying my cell phone with me as I could snap photos of the looming mountains still a bit covered by snow, the ice waters next to Anchorage, the cranes sitting in the marsh land and moose simply roaming free. Alaska really is the “Last Frontier” as you see on all the license plates. It’s truly a place where animals and people just live in harmony and share land equally. The coldness. As someone coming from a hot state, the 50-degree temperatures waiting for me up north were plenty shocking to the system. During the race, the weather turned warm with plenty of sunshine. However, it soured quickly. Be prepared for changes in temps throughout the race. I finally fulfilled my dream of visiting Alaska and recommend this race, although don’t expect a PR–be prepared for a challenge. Is Green Coffee Extract Worth All the Buzz? Every few years new supplement hits the market that, for a time, is hailed as a miraculous solution to weight loss. The most recent key player is this ever-changing arena is green coffee extract, which spiked in popularity when Dr. Oz called it “The green coffee bean that burns fat fast.” He further stated that no diet or exercise was necessary. And that all sounds pretty great but, what’s so special about green coffee and does it really work? Basically, green coffee is coffee that hasn’t been roasted. Roasting coffee beans cause many changes to their chemical composition and dramatically decreases the levels of chlorogenic acid or CGA. This polyphenol has been attributed all sorts of benefits, with supporters claiming that it will stimulate rapid weight loss, prevent diabetes, lower blood pressure. These statements are, in part, based on the fact that coffee drinkers are statistically less likely to develop the aforementioned health problems. Because of these claims, CGA is found in scores of weight loss supplements and is the active ingredient in green coffee extract. A more recent study published in the Journal of Agricultural and Food Chemistry found that CGA supplementation, even in very high doses did nothing to lower the risk of obesity or diabetes in mice that were fed a high-fat diet. Startlingly, the mice that were given CGA were more likely to develop fatty livers, as well. It’s important to remember that this study used CGA alone, rather than a standard green coffee extract. However, since CGA is the key ingredient in green coffee extract, these findings shed serious concern on the usefulness and safety of the supplement. Ultimately, green coffee extract is still coffee and still contains caffeine, which could be at the root of, or at least a major contributor to, the purported health benefits. Caffeine, though, can also cause many health problems and should be used cautiously. Always discuss any supplements with your doctor before beginning self-treatment. The logical conclusion used to be that, to lose weight, you had to starve yourself. Then, when we began to understand the dreaded “starvation mode” the popular thinking said that the secret to losing weight was to actually eat more. This thinking generally encouraged six small meals a day to jump start your metabolism. But, recently, a new trend has cropped up that challenges this idea: Intermittent fasting (IF). What is IF? Does it work? Could you benefit from working it into your training? Intermittent fasting is exactly what the name suggests: regularly going without food. The exact form the fast takes, though, depends largely on you. The two primary methods are the periodic fast and the daily fast. The periodic fast requires that you take a full 24 hours offer from food. But, exactly how often you do this is somewhat up in the air. Some people do it once per year, occasionally for religious reasons, others do it as frequently as once per week. The daily fast is a shorter fast that is incorporated into your daily schedule. Usually, it consists of a 16 hour fast and an 8 hour feeding window. For example, if your first meal is at 9am,, your last meal of the day would be at 5pm. One of the most difficult questions to answer when it comes to any diet is “Does it work?” Basically, any diet that forces you to eat less will help you lose weight. For a while, at least. So in order to decide whether or not a diet works, you first have to decide what you expect it to do. As mentioned, restricting your calories through fasting will, most definitely help you lose weight. But, proponents of IF promise much more than weight loss. Its supporters claims that IF can help you balance your insulin response, which affects several hormones and that it will encourage a lean, muscular appearance. It’s also been stated that IF can even help you live longer and improve your cardiovascular health. Surprisingly, most of the evidence supports these attractive benefits promised by intermittent fasting programs. Numerous scientific studies have found that IF increases insulin-sensitivity, which helps to mediate blood sugar levels. Insulin resistance is a major red-flag in the development of type-2 diabetes so, IF may have potential in preventing diabetes. This increased sensitivity to insulin also means that nutrients are getting to your muscles faster and more efficiently. When your muscles are well-fed they grow and recover more quickly, which will in turn burn fat. However, this detailed effect of IF is not totally proven, or disproven, in clinical trials. It’s worth noting that most of the support for these claims comes from anecdotes. As usual, the “longer, healthier life” claims are very difficult to come to a clear decision on. Some studies have shown that a restricted-calorie diet can actually shorten life-span, while others disagree. A few studies have even linked IF with an unexplained hardening of the walls of the heart, leading to a decrease in the heart’s efficiency. Since IF is a relatively new fitness phenomenon, there’s little clear understand as to the long-term effects. These findings may shed a discouraging doubt on the usefulness of intermittent fasting. Women may also want to use some extra caution. Many animal and human studies have found unique risks for women, including a decrease in heart health and increase in LDL cholesterol. Because of these risks, most experts recommend that women use a 14 hour daily fasting program. Have you tried intermittent fasting? Please share your experience with us in the comments! Although it falls under the “track and field” umbrella and is grouped together with many sports that place their emphasis on cardiovascular endurance, throwing requires an immense amount of explosive strength. The power used in all throwing events, including discus and shot put, comes from a complicated, full-body motion that allows every ounce of your effort to be channeled into your throw. Regardless of what technique you favor, then, whether you throw with a glide or a ration, all throwers can benefit from a well-designed strength training routine. It’s true that you will likely experience benefits from following a general weight lifting routine but this type of training could still leave something lacking for the thrower. Since it doesn’t mimic the movement, and therefore the stress on your body, of a throw you could be risking an injury. A functional routine, however, would copy what your body experiences during a throw and thus give it an opportunity to adapt. So, in designing your workouts, break your technique down into stages and select a series of exercises that simulate each stage. For example, your obliques and other muscles of your core are key in the rotation, as are those in your hips. But your arms, chest and shoulders each play a vital role in the final steps of the throw. By selecting exercises for each of these muscle groups that expose it to what you will expect of it during the actual throw, you make a focused effort that allows each muscle to strengthen in very precise ways. Strength isn’t the only aspect to consider, though. Flexibility and overall range of motion come into play as well. In the same vein, well-chosen exercises will copy the movement that each joint will experience during a throw. Simply put: pick exercises that look and feel like a throw. While you can be creative with your training and utilize whatever resistance you have available to you, the most obvious choice is the medicine ball. These large, weighted balls will build your dexterity and grip in addition to the benefits we’ve just discussed. One challenging, but effective exercise is the wall bounce. Grab a medicine ball and standing facing a sturdy wall. With a safe distance between you and the wall, throw the ball with a two-handed push, stepping forward with one leg. If you’re right-handed, step with your left and visa versa. The goal is the throw the ball with enough force to make it bounce off the wall so that you can catch the rebound. Start out light and gradually increase the weight of the ball. A similar drill can be performed with a partner by passing the ball forcefully and quickly between you. When you catch it, cradle it all the way to your chest before tossing it back. The side arm pass will help to develop your rotational strength and explosive power, as well as your balance. Catch the ball on your side and throw it back to your partner with a follow-through twist. Perform this on both sides. If you don’t have a partner, you can also perform oblique twists with the medicine ball. Another drill very closely resembles a kettlebell swing. In fact, if you’re working out on your own, the kettlebell swing is a useful alternative. Otherwise, have your partner pass the ball low so that you can catch it between your legs. Quickly swing upwards so that your partner has to catch the ball above his/her head. Make sure to keep your back straight throughout the movement and drop your hips as you lower yourself to catch the ball. These are just a few of the many drills and exercises that you could use to improve your throws. Please share your favorites in the comments!